The 40 metre motor yacht Brazil has had a central agency change and is now listed for sale by Jeromy Mould and James Greenwood at Worth Avenue Yachts. Built in aluminium by Dutch superyacht yard Heesen Yachts to a design by the late Gerhard Gilgenast, Brazil is ABS classed and was delivered in 1993 with several upgrades and refits since. A contemporary interior by Claudette Bonville can accommodate up to ten guests in five staterooms. The master suite has a king sized bed and a mini bar, while the VIP stateroom also boasts a mini bar and there are a further two double and two twin cabins, all with entertainment systems, LCD televisions and en-suite facilities. Her relaxing main deck saloon has a lounging and relaxation area, an entertainment centre including a 56-inch flat screen television and electrically operated sunshades and curtains. Forward is a separate dining room with comfortable seating for up to ten guests and outside, the aft deck is equipped for al fresco dining with a large rectangular table for up to ten guests. More outdoor enjoyment is available on the expansive sun deck, with dining for up to 12 guests, a bar, barbecue, a six-person Jacuzzi and sun pads. Twin 2,105hp MTU diesel engines on this yacht for sale power her to a cruising speed of 17 knots, topping out at 19 knots. 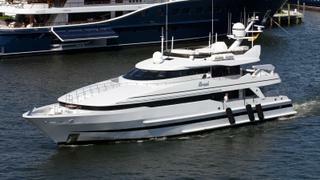 Her 2014 technical refit included her 20 year ABS hull and machinery special survey.